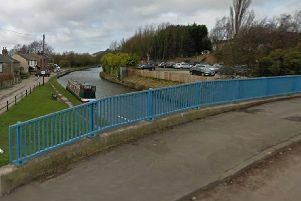 Traffic was thrown into chaos for five hours after yet another lorry got itself wedged under a notorious Wigan bridge. The HGV’s trailer was jammed on the Orrell side of the Gathurst Road railway bridge, the driver having missed or ignored height restriction signs further up the road. Police were initially letting traffic through in one direction at a time after the 4.30pm collision on Monday but eventually shut it, meaning a long detour for vehicles through either Standish Lower Ground or Roby Mill. The driver, who was unhurt, detached the tractor part of the HGV but it was only at 9.30pm that the trailer, complete with buckled roof, was recovered and the road re-opened. Network Rail inspectors were called to look at the bridge which carries the Manchester to Southport line. There have been numerous lorry incidents at Gathurst Road railway bridge over the years although the majority of them have involved truckers’ realising their juggernauts aren’t going to fit under it and then jack-knifing as they try to turn the vehicle round. Not many have misjudged the height and tried to get through. It has led to several improvements to signage warning of the height restrictions but still the incidents happen, mainly to lorries coming from the direction of Orrell rather than Shevington.